Raja Ampat’s homestay operators are steadily developing the training, experience and resources necessary to satisfy the diving community’s demand for a cheaper alternative to the region’s foreign owned resorts and liveaboard boats. Regardless of which homestay you stay at, diving in Raja Ampat can be arranged in conjunction with the Raja Ampat dive shops listed above. 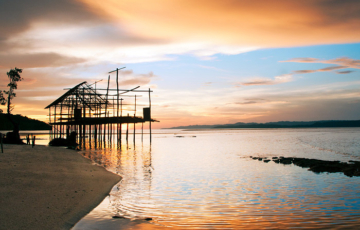 Additionally, Arborek Dive Shop on Pulau Arborek provides diving for Arborek Homestays and visitors to Arborek. First Aid Oxygen supplies are limited: Not all homestays have first aid oxygen available in their dive boats. A supply is based at Wobbegong Dive Adventures on Kri, but is not unlimited and may require travel from a dive site to use. There is no hyperbaric chamber in Raja Ampat: A chamber has been installed at Waisai hospital, but is not certified for use by any inspection body and at last report was not compliant with international standards. Expert advice recommends that the chamber not be used and that any diver requiring hyperbaric treatment be evacuated to Manado. Note that specialist flights that maintain the patient at sea level pressures are required. Such flights are extremely expensive and usually require upfront payment. Be sure to check that your dive insurance covers the costs of these specialist medevac flights! Equipment maintenance may be lacking: Thorough equipment checks are essential, as maintenance may be lacking. Be sure to check that tanks are in test. If you’re considering diving with Raja Ampat homestays, please consider these risks and read the additional important safety information below. Even though most homestays do not have their own dive equipment, all those based in the Dampier Strait can arrange dive trips with the homestays listed above, or with other local dive centres. 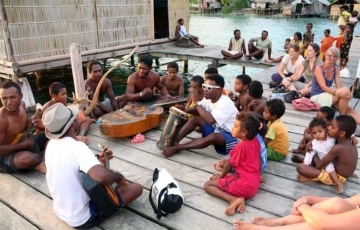 Dampier Strait homestays include all those on Kri, Gam, Arborek and the south coast of Waigeo. Another alternative (if you are part of a group of experienced divers and have your own equipment) is to hire a reputable local dive guide and boat and dive independently. Raja Ampat can be a challenging dive environment and is not recommended for beginners or inexperienced divers. The Dampier Strait in particular, where many of the operators listed on this site are located, generates very strong currents as ocean tides channel huge volumes of water through its confines. In November 2015 an experienced diver had a fatal accident at Chicken Reef in the Dampier Strait – the first that we’re aware of in Raja Ampat. The exact cause of the accident is not currently known – see this facebook post for the details and updates. As a qualified and experienced diver, you will be aware that wherever in the world you dive, you do so at your own risk, whereby you and your ‘buddy’ are responsible for each other’s safety. This is particularly the case in Raja Ampat, where extensive professional dive centre management experience is yet to be developed and basic emergency equipment is not widely available. None of the homestay operators have insurance to cover you in the event of a serious accident – so you will need to arrange your own personal dive insurance that provides for specialist emergency medical evacuation. (See the above “Vital Considerations” note about the Waisai decompression chamber.) Divers Alert Network is one example of a supplier of such insurance. Unless you’re a master diver with a wealth of experience in challenging environments, don’t consider diving Raja Ampat without an experienced guide who is familiar with the conditions at your proposed dive site. It’s imperative you do your research before choosing a dive guide. Consult as widely as possible with other divers and only commit to a guide recommended by those you trust. Tidal forces in Raja Ampat generate strong and unpredictable currents (including powerful downdrafts and upwellings) and ignorance of local conditions and hazards could put your life in danger. There are no hospitals in Raja Ampat capable of treating the injuries and complications that can result from a serious diving accident. Raja Ampat is extremely remote and for safety’s sake, it’s imperative you plan non-compression dives and take a conservative approach to safety stops and controlled ascent. There’s more than enough to see within no-decompression limits and the nearest hyperbaric chamber (at Manado in Sulawesi) is much too far away if something goes wrong. Our Raja Ampat Health and Medical FAQ has more about the region’s hospital services and health considerations. Current best practice to avoid decompression sickness (DCS) should always be followed. 2. Limit your speed of ascent. Limiting speed of ascent may be the most important (and easiest) way to reduce the risk of DCS. Traditionally, divers in the US were trained to limit their rate of ascent to 18 meters/min (or 60 feet per minute). There are still people who think that is the rule, but in fact 18 m/minute is way too fast. Over the past decade, a number of certification agencies have cut that in half, teaching students to limit ascent rates to 9 m/min. In reality, however, 9 m/min is still too fast, and it misses the point that the maximum speed of ascent change according to depth – the shallower you are, the slower you need to ascend. That’s because the relative change in pressure per meter is much higher at shallow depths than when the diver is deep. 3. Always make the first dive of the day the deepest, with each subsequent dive in the same 24 hour period having a maximum depth that is shallower than the previous dives. If a “reverse profile” is unavoidable, make sure the difference from the maximum depth of the later deeper dive and the earlier shallow dive is no more than 5 meters. The Trouble with Bubbles – this is an in depth technical analysis of the physics and physiology of decompression, the nature of decompression sickness, basic decompression theory, including a good discussion of “M-values” and “gradients”, both of which are tricky. That leads into a discussion of bubble models of decompression, deep stops, and Bruce Weinke’s RGBM decompression model (this is the one emulated in Suunto and some other dive computers). This document provides the basis for the new recommended maximum ascent rates quoted above. Check that your travel insurance covers you for specialist emergency medical evacuation in the event of a diving accident. 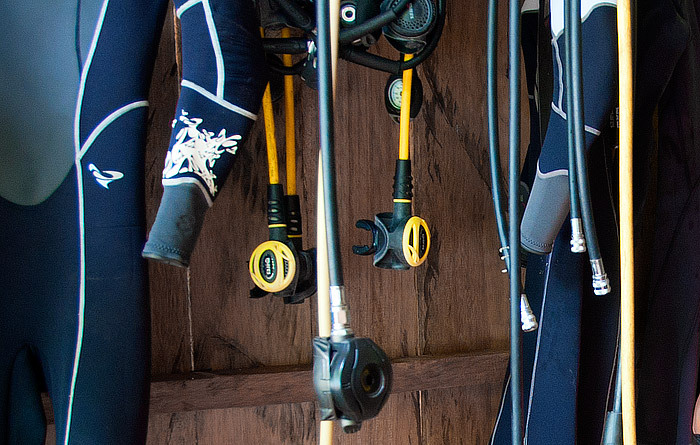 Equipment checks: When using rented equipment, take special care to be thorough when doing your pre-dive checks – we’ve heard reports of inadequately maintained equipment being supplied by some operators. Bring a dive computer – you’ll get much more out of your stay (and be much safer) if you do. Dive within your limits. There is so much to see in the 5m-18m range that there is rarely a need to go deeper. Double-check with the dive guide that you and your group (which may include divers that you do not know) have understood the type of dive, the likely profile and the intended pick up point. Help the dive guide by sharing responsibility for all the divers in your group. Review the usual hand signals with the dive guide and others in your group, to ensure that you can be easily understood when at depth. Have a good (or bad) experience? Want to make a recommendation? Do it in the comments section below or on the relevant homestay page. We welcome all honest feedback and your fellow divers, your hosts and dive guides will benefit from your input. Always observe the provisions of the Raja Ampat Diving Code of Practice which has been developed to protect Raja Ampat’s unique marine environment and maximise your safety. Speak up if you see those provisions being ignored by operators or fellow divers! We encourage you to post your personal observations and any concerns in the feedback section of the relevant operator’s page on this site – here’s how that will make a difference. You’re also welcome to forward reports to us privately by email. SSI and PADI courses from fully qualified instructors are available at Raja Ampat homestay dive centers. See this news article for more info. Some resorts also offer PADI/SSI courses. You can dive Raja Ampat at any time of year, but best conditions are between October and April. Sea temperatures are warm (between 24 and 30°C) all year round, so light wetsuits are usually best. Wetsuits or lycra swimsuits are definitely recommended, because you’re almost certain to encounter waters rich in stingers (nematocysts) at some stage. See our Raja Ampat weather page for more detailed climate information. Where are the best dive sites in Raja Ampat? Some old hands say that the best dive sites are yet to be discovered. But in the meantime there is such a wealth of great sites to choose from, that some divers become quite overwhelmed with the choice. One good tip is to listen to the local dive guides and boat crew. They know the currents and the seasons and can usually guess which sites are a good bet in any given conditions. And remember: the best dive site is the one that you can relax and enjoy because you are well-prepared, diving within your limits and have confidence in the people around you. If you fancy some background reading, Burt Jones and Maurine Shimlock’s book Diving Indonesia’s Bird’s Head Seascape, which covers all of Raja Ampat, Cendrawasih Bay and Triton Bay is highly recommended. The book describes over 200 dive sites in excellent detail, including GPS coordinates, dive profile and photographic recommendations. The book also has a wealth of other essential and background information. Check it out at their Secret Sea Visions website. Although out of print, Burt and Maurine’s earlier book Diving Indonesia’s Raja Ampat, is also a great resource and is still widely available in Indonesia – check the airport, Periplus and Gramedia bookstores for copies. For more about diving in Raja Ampat and the wider Bird’s Head Seascape, see birdsheadseascape.com’s diving pages. I’m an experienced dive instructor with all my own gear, dived in Raja Ampat before but from Liveaboard and this time would like to be land based. Can you maybe recommend a couple of places in particular from the site that might suit me? Id like to be in R4 maybe for a couple of weeks, is booking accomm/diving in advance necessary and can one easily move around homestays? (for example I’d probably book the first 2 or 3 nights and then suss out other places when I’m there). If diving is your main aim, then we’d recommend staying at one of the homestays with an on-site dive center. Those are all linked from the bullet points at the top of this page. It doesn’t really matter which of those 7 you choose, as they all dive the most popular sites. Beyond that, reading the guest comments at the foot of each page might help you narrow the choices. All homestays can arrange transfers to other homestays, so it’s easy to move around. Booking in advance is definitely necessary if you want to stay at dive center (or any other popular) homestays. Hello! First congratulations for an excellent page! Dive prices are no more expensive if you are alone. Some places may charge a bit more for single occupancy of bungalows. Any of the places linked in the bulleted list at the top of this page would be fine. If you plan on doing a lot of diving, you might want to consider the accommodation and dive packages offered by Wobbegong Dive Adventures. do you know whether I can find anything about Pak Harun’s homestay and scuba diving on Misool? If so, I ask you to be so kind and send me a link / links. If not, maybe you know whom else I may ask. Thank you very much for your assistance ! You’ll find links to guides who can help you with that on our Misool page, and members of our Raja Ampat Travellers’ facebook group could help too. We can highly recommend the RAG-d divers next to Mambei & Delvin homestays on kri. The equipment is all new and Alfie, Roli, Jodi and team are extremely competent and sensitive to individual’s requirements and skills ensuring great, safe diving to match abilities. The coral and variety of marine life during all the dives we went on were stunning – a very special place that we hope to come back to – it is now top spot of our travel destinations. Hi, please could some one recommend a good place that can offer a PADI or SSI open water course? In Europe we can do them for €250 which is about $300 and I’ve been offered it at €500!!! How much were the dives? And where did they dive to? My fiancé and I are in Yogyakarta right now and are planning to fly to sorong tomorrow and then going to Raja Ampat hopefully Saturday. We are both open water divers but just with 6-9 dives behind us. Can you recommend where it’s best to stay and do a few dives in Raja Ampat with our experience? Should we book the home stay before we arrive in Sorong or can we just do it there? As it says above, Raja Ampat can be challenging for inexperienced divers. We’re not divers and are not well enough informed to make recommendations. Can only suggest you review the comments left on the pages of the dive centers linked above and make a decision based on those. Reviewing a few diving websites would more than likely provide extra information to help you too. You might find it difficult to get accommodation at the more popular dive center homestays at such short notice, but you always have the option of staying at a nearby place and diving with the diving operators. Hello and congratulations for the great website. I’m planing a 6D/7N trip to R4 in the coming February or March mainly for diving (5 diving days or so). I am about to book a homestay (Corepen) but I don’t know how to book the diving itself. Is booking for diving actually needed? Should I contact the dive shop directly (how?) or through the homestay? Booking diving isn’t necessary – you can arrange that with Corepen when you arrive. Good morning and Thank you for such a great website! Lovely and useful. I am planning to go with my partner to raja ampat in late november and we are a bit afraid because we are OWD with only about 10 dives each. Yes – additional training is possible at Wobbegong Dive Adventures. All good homestay dive centers will also assess your capability prior to dive site selection. Really nice site, my girlfriend and I plan to visit Raja Ampat next November and we have few questions. – Same thing regarding diving, can we just go tho the dive centers and book the dives or is it possible that doing it that way everything may be fully booked and we can not dive then…? Unless you want to stay at one of the most popular homestays (all on Kri), it is not necessary to book in advance. You will always be able to find a room and all homestays can arrange transport to other islands when you want to move on. It’s the same for diving. If you stay on Kri, you should have no trouble organising a dive at short notice. There are several homestays on Kri that offer diving. More info about how to get there is here. Hi, thanks for the informative website. I am planning a diving trip to this area in October 2017 and mainly want to dive Sel Pele for macro photography. I have carried out research into European seahorses and nudibranchs in the Mediterranean for many years and would love to photograph the more colourful tropical species. Is there a homestay with diving facilities near Sel Pele? I understand that fuel is expensive for getting to dive sites. I would rather support the local economy than big tourist companies. Also I want plenty of time underwater to study macro critters rather than being led around in a shoal, so a good house reef would be great. Any recommendations? Thanks. We haven’t heard of any homestays at Selpele yet, but it’s a long way out and there may well be some there. You certainly don’t need to go that far for fabulous macro stuff though. 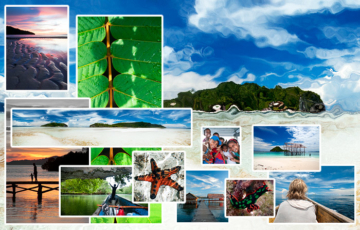 If you want somewhere quiet, we’d recommend Nudibranch Homestay for …. nudibranchs ( :P ) and somewhere like Koryau Kayem for seahorses. Almost all homestays have great house reefs with both though, so almost anywhere would do. Hello. We will travel Kri island in november. And we will decide to stay Koranu fyak homestay. Could we pay as usd or euro OR I have to pay only indonesia rupiah? If we can pay usd or euro, can we know the exchange rate? You must pay in IDR Kimi. Or you could use a credit card, but be sure to read the info about using foreign bank credit cards in Indonesia before relying on one. Your complete infos is really useful and helpful for people like me who never visit Raja Ampat before. Thanks a lot. Thanks for a great site for Raja Ampat visitors. Seems like I’m going to be able to find all the necessary info here. I’d like to visit Raja Ampat with my girlfriend. We’re both freedivers and I didn’t find any info on freediving in RA, only about snorkelling. Is there a dive center with freediving experience that I could contact? We need to know more about freediving conditions, currents and stuff. Apart from local people, we’ve never heard of freedivers in Raja Ampat and none of the diving centers we know of cater to them – sorry! Did you by any chance find info elsewhere? I have the exact same question as you as I’ll be in Raja Ampat January 2018 for a scuba luveaboard but am hoping to do a week of freediving as well. There is a (pretty expensive) dive resort on gam offering freediving sessions (35$/session with equipment&guide). Thats what i read online – google it! There are also freediving liveaboards, but only a few times during the year. As a solo freediver im struggling too to find some centers that can do it. So far im finding some buddies on the facebook pages of this website, but otherwise only expensive and rare charterboats. Actually im planning to find some local fisherman in Mansuar, which I can eventually hire also as a guide/buddy. If you come up with something better id really like to know. Hit the news article link in the “Learning to Dive in Raja Ampat” section above for details of homestays offering dive courses. I had a look at Ranny’s page but am a bit unsure how she operates. Is she an independent tour operator? How does she charge and how much? I didn’t see any prices on her page. Ranny is an independent tour guide for people wanting to put together any kind of itinerary. She doesn’t do fixed tours, hence there are no prices on her page as trip cost will vary according to her clients’ requirements. First congratulations for this webpage, is excelent!! Second I´m just preparing a travel around Indonesia from the next middle April to middle May and I would like to do a liveaboard diving trip in Raja Ampat, so how do you recommend to book this trip? It´s possible do it when I stay in Sorong? is any operator there? or I can talk with the boats owners direcctly? or there are some place that I could get all this information about the schueddle of the liveboards, routes, prices…? Information about Papuan owned liveaboard tours can be found on our liveaboard boat tours page. Other diving liveaboard operators have their own websites which can easily be found by search engine query. There’s also a fair bit of comparison of those available on diving forums. i’m preparing the same trip of yours, same time! could you tell me if you get good adress ! also if they need on more diver. I am going to Raja Ampat on 24 of October. I am staying at Hamueco. Can you recommend any dive centres nearby? Hi Thomas – the nearest homestay dive centres to Hamueco are these ones on Kri: Wobbegong Dive Adventures and Yenkoranu Homestay. Thank you for all the info. I was wondering that there are possibilities to rent dive tanks in Homestays or other places. We have our own boat with compressor but unfortunately our compressor is broken. We are at Batanta right now heading our way over to Kri and Wayag via Pef. Can you please tell us what the options are of renting tanks or filling our own? We would appreciate very much a reply at your earliest convenience as we’re currently in Batanta. Thanks a lot for your help! Hi Boris – Due to the limited number of tanks and high level of demand you probably won’t be able to rent tanks, but any of the homestays with compressors (linked above with location maps on their pages) would be able to fill your tanks for you. Good luck! The divemaster, Anne at Yenkoranu Homestay on Kri is very friendly and helpful. I’m sure they will help you if they can. They have good facilities and are also fun to hang out with. Thanks a lot for the swift response. I sure will have a look at the map. Thank you once again. Do you know if any of the homestays that offer diving has an oxygen tank on the boat? That’s basic safety but I’ve read they don’t! Hi Melina – it’s true that at present, none of the homestay dive operators have emergency oxygen available. This will no doubt change as their businesses grow and develop more resources, but for now it’s very much a matter of choosing a reputable operator and diving conservatively. Is it easy to buy or hire diving weights in Raja Ampat? Are there shops in Sorong or Waisai and do you know what approximate prices would be? We are planning to stay at Koryau Kayem homestay and we won’t be using any of the diving operators. I’ve never seen a dive shop in Sorong or Waisai, so I don’t think it will be easy. You might be able to hire weights from a nearby Homestay that offers diving. Perhaps another reader can tell us more? No matter if you’ve a poor accomodation, we only need a bed, food and all that is necessary for two or three dives per day. Has any homestay got a dive compressor and a lot of tanks in good condition? No homestays have a dive compressor yet – you’ll have to ask at a dive resort if you need tanks filled. Yenkoranu and Mangkur Kodon offer diving, so they would have tanks available. We don’t know many or in what condition. We have heard reports of poorly maintained equipment being supplied (even by the resorts), so be sure to thoroughly check any equipment you hire. Hi! Do Yenkoranu and Mangkur Kodon aready have a dive compressors? They obviously mus have also generator for power for dive compressors, right? Do they also have a back-up generator? Apologies for the late moderation of and reply to your query – we have only just returned from Raja Ampat. Yes – as stated in the article above, Yenkoranu and Mangkur Kodon have dive compressors. They also have generators for electricity, but we haven’t heard of any homestays with backup generators. Detailed information about individual homestays can be found on our accommodation page by clicking the photo or name of the homestay.